make it easy for me to refer to the Flickr image in my blog post or index. I searched my existing photos to see if a photo with that title already existed. If it did, I displayed an Org-style list item with a link. If it didn’t exist, I uploaded it, set the tags, added the item to the photo set, and moved it to the folder. Then I displayed an Org-style link, but using a plus character instead of a minus character, taking advantage of the fact that both + and – can be used for lists in Org. What were some other ways I could get the information into Emacs aside from copying and pasting from the terminal window? Maybe I could put text directly into the clipboard. The node-clipboard package didn’t build for me and I couldn’t get node-copy-paste to work either,about the node-copy-paste README told me about the existence of the clip command-line utility, which worked for me. On Windows, clip allows you to pipe the output of commands into your clipboard. (There are similar programs for Linux or Mac OS X.) In Node, you can start a child process and communicate with it through pipes. I got a little lost trying to figure out how to turn a string into a streamable object that I could set as the new standard input for the clip process I was going to spawn, but the solution turned out to be much simpler than that. Just write(...) to the appropriate stream, and call end() when you’re done. Of course, to get to that point, I had to revise my script. Instead of letting all the callbacks finish whenever they wanted, I needed to be able to run some code after everything was done. I was a little familiar with the async library, so I used that. I copied the output to the clipboard instead of displaying it so that I could call it easily using ! (dired-do-shell-command) and get the output in my clipboard for easy yanking elsewhere, although I could probably change my batch file to pipe the result to clip and just separate the stderr stuff. Hmm. Anyway, here it is! * means the photo already existed, + means it was uploaded. and away I went. Not only did I have a handy way to process images from the command line, I could also mark the files in Emacs Dired with m, then type ! to execute my up command on the selected images. Mwahaha! 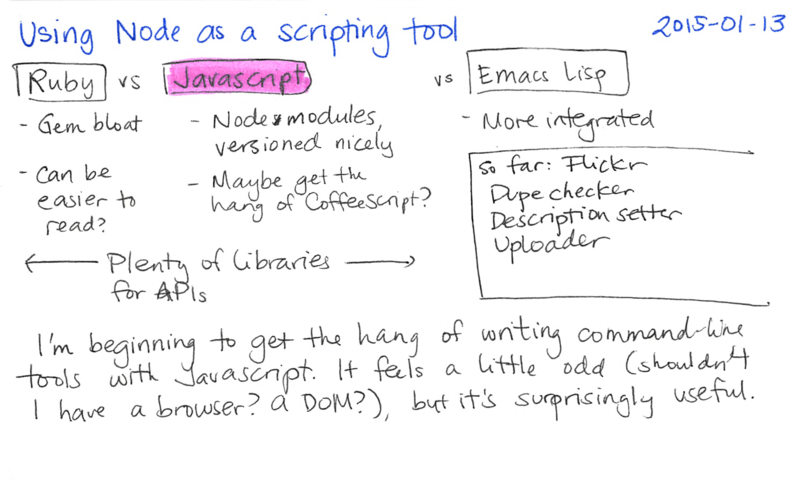 Anyway, I thought I’d write it up in case other people were curious about using Node to code little utilities, filling the clipboard in Windows, or getting data back into Emacs (sometimes the clipboard is enough). I needed to pass -n as one of the arguments to emacsclient so that it would return right away. The : after store-link is important! I was passing org-protocol://store-link/foo/bar and wondering why it opened up a file called bar. org-protocol://store-link:/foo/bar was what I needed.